My childhood in Riga, Latvia involved two streams of water, the Daugava and the Marupite. The former is the national river of Latvia, originating in the Valdai Hills of Russia and winding its way through Belarus and Latvia, past my birthplace city before emptying into the Baltic Sea. Known to Russians as the Western Dvina, this river has nearly 630 miles of history and natural beauty. The Marupite, in contrast, is a two and a half mile-long creek flowing through the southwestern suburbs of Riga, originating among farm fields and winding its way past backyards, underneath highways and railways into a pond before emptying into the Daugava, within sight of the medieval Old City district. My first home was in Tornakalns, a suburban neighborhood where the creek flowed through the scenic Maras Dikis pond and Arcadian Park, which has a landscape resembling Manhattan’s Central Park. I have always been curious about the origins of this stream and at age 7, I hiked its route with my grandfather in search of its source. That year, Latvia became an independent nation amid the collapse of the Soviet Union. The following year, we immigrated to New York. 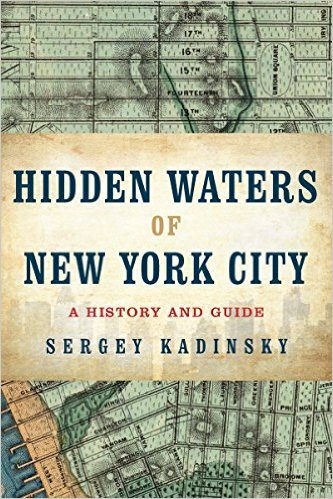 That’s what this book is about, the hidden streams that remind us of nature’s presence in New York City. Some of the city’s streams have disappeared long ago, but their names are hinted on downtown Manhattan streets such as Broad Street, Maiden Lane, Minetta Lane and Canal Street. Another set of streams have been straightened and tamed into canals, such as Newtown Creek and Gowanus Canal. Both of these streams are receiving much needed care in natural restoration, perhaps none more significantly than the Bronx River. Other streams located further away from Manhattan, such as Flushing Creek and Westchester Creek, remain forgotten and partially buried underneath the city’s infrastructure. These now-hidden urban streams provided the wampum currency used by the native Lenape people, powered the gristmills of New York’s colonial settlements and served as freight transportation corridors during the industrial revolution. Streams that avoided burial are now experiencing a new life as linear parks, storm water conduits and in mitigating flood damage. Alongside these practical examples, what additional benefits do urban streams offer to cities and their inhabitants? Is there a purpose to urban streams that transcends land values and environmental sustainability? What connection do they have to a city’s identity and sense of place? This book seeks to answer that question. We would like to see if your research includes buried waterways in Red Hook, Brooklyn. We are looking for info that would be pertinent to the Red Hook WaterStories project being done by non-profit PortSide NewYork. More on that at http://bit.ly/RedHookWaterStories. We just bought a copy of your book.